How many times have you heard this statement? Some may answer that a newborn baby needs very little aside from loving parents. But some of the simplest necessities cost the most: diapers, clothing, a car seat, and food. Join us over the next few weeks as we share some ideas for saving money on baby basics. First my diaper story… many of you know that I have twins. Thankfully they are 5 and out of diapers but my two year old is not there yet. For the twins I attempted cloth diapers out of sheer desperation and then I lost my mind (seriously). We weren’t couponing at the time so I did the next best thing always buying house brands. They did great but we spent a ton of money. The cheapest house brand I liked was still around $7.50 a pack and we could go through a pack a day! Currently though my two year old has it great. With coupons and store sales we usually end up with free diapers or at most paying less than $5 per pack for name brand diapers. 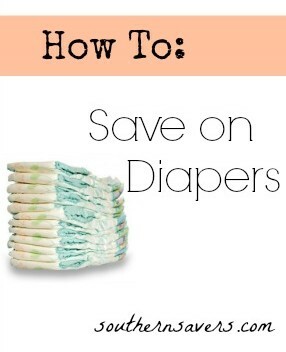 It may seem old fashioned or even gross to some, but when you start doing the research you will find that choosing cloth is by far the best way to save on diapering. The average family spends anywhere from $1,500 to $3,000 to diaper one child to age three, depending on how good they are at finding the most economical disposable. This price doesn’t include disposable wipes (which are sometimes almost as much as the diapers), a special diaper pail, all those little plastic baggies to minimize smell, etc. Multiply these numbers by three (or more), and we’re talking about nearly $5,000-$10,000! Families who choose cloth diapers (even the most expensive all-in-ones) rarely spend over $500 on diapers and associated gear. Even when you add in the cost of laundering, the total doesn’t come close to the amount spent on disposables. Don’t forget that quality cloth diapers can last a family through several children. To further reduce start-up costs, you might even consider buying gently used diapers (check Ebay or Craigslist) or making your own if you have the talent. Once you have the diapers, you can save on laundering by letting your diapers line dry, which also helps them to smell fresh and remove stains. Finally, many choose to cloth diaper because they feel it is a superior product that is more comfortable for their child or because of the environmental impact. Don’t forget, this doesn’t mean that you can’t use disposables for convenience on occasion. Simple Mom has a comprehensive guide to cloth diapering in her archives. If you have done the research and have decided cloth diapering is not for you and your baby, there are still ways to save. There are some amazing deals on disposables at drugstores and grocery stores. Many of grabbed Huggies for $2.99 a pack at Harris Teeter a couple of weeks ago, or Pampers for $3.49 at CVS. Look out for those rock bottom prices and stock up, even before baby is born. Make sure to sign up for newsletters from your favorite (or all) brands as they will often send you coupons through the mail or email. I will not detail the drugstore systems in this post, but if you are new to Southern Savers, check out our Getting Started Guides. 3. Bulk or House Brand ?? For the same amount of diapers you save $17 to buy them in smaller sized packages with coupons for each package. Again, just my opinion, but I think that buying house brand or wholesale is best saved for those times when your stash runs low, or you’re out of town, and you just have to buy diapers now! Especially since one must include the cost of a wholesale membership in the cost of wholesale diapers. However, there is one bulk source that could be useful – diapers.com. They are constantly running deals for free shipping, offering $10 off for new customers, giving special codes, and offering rewards. Plus you can mail them coupons and they will apply them to your account!! You aren’t going to save enough to pay for your child’s first semester of college, but every little bit counts right? You can earn anything from gift cards (some for more diapers), toys, baby gear, or photo albums. You can find codes on manufacturer’s products, but there are also general codes to be found on the internet (here or right here on Southern Savers). Check out Pampers’s Gifts to Grow program and Huggies Enjoy the Ride program. Crazy thing – people love to buy stuff for a new baby! If you are expecting your first baby, don’t forget to include diapers (all sizes) and gift cards on your registry. When a relative or friend calls and asks “Do you need anything? We’d love to come visit!” Say, “Sure! You can stop by and bring us a pack of diapers.” If you are a veteran momma who already has all the gear and clothing, ask your friends and family to throw you a diaper shower instead. Also babies grow fast, leaving their mommas with a surplus of diapers that are too small or cloth diapers that are no longer being used. If you have a friend (or two or three) with older children, ask her to save you her extras or gently used cloth diapers. Even your church nursery might have unused diapers lying around. One of the many joys of motherhood is the community that comes with it, so don’t be afraid to lean on your fellow frugal mommas.